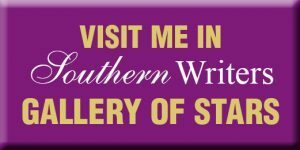 Southern Writers Magazine: What Will Be Your Author Legacy? Now what? 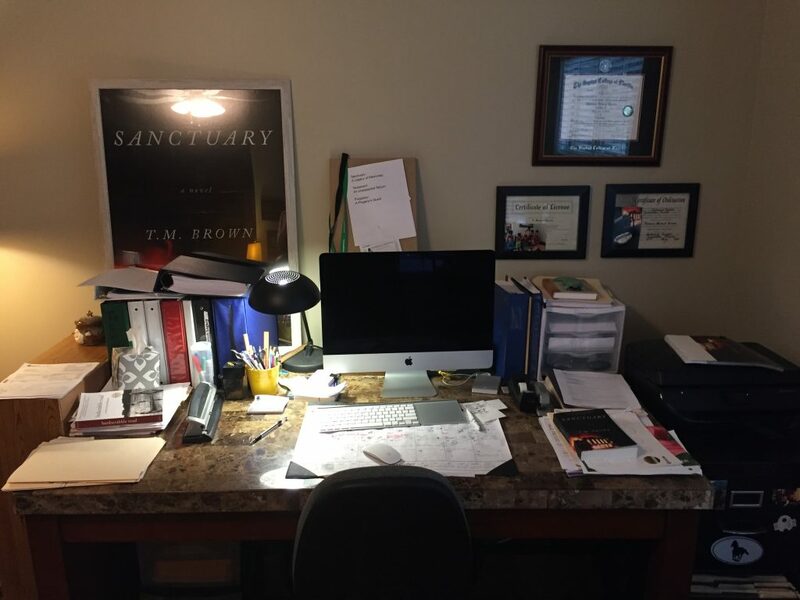 Over the holidays as I began writing the third installment, I pursued a vital third question about crafting novels – why. An author must come to grips with the motivation and internal message that each story tells. After some soul-searching, I realized the events surrounding one of my characters had played out a true-to-life, relevant role within the main story. 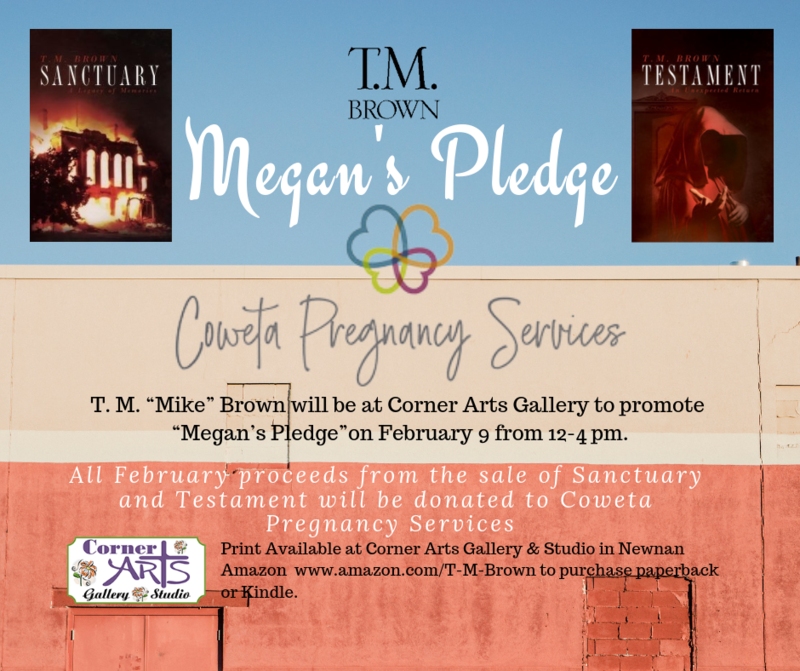 Without revealing too much of the story, Megan succumbed to being coerced into making a choice only a woman can make, but she learns in the story choices have consequences, and most often unintended and far-reaching too. No matter how hard anyone buries such a dark secret, eventually it surfaces to the light. I tried throughout the story to reveal a truth we should all realize, God knows all our secrets. He knew we would make the decisions we did long before we created them. 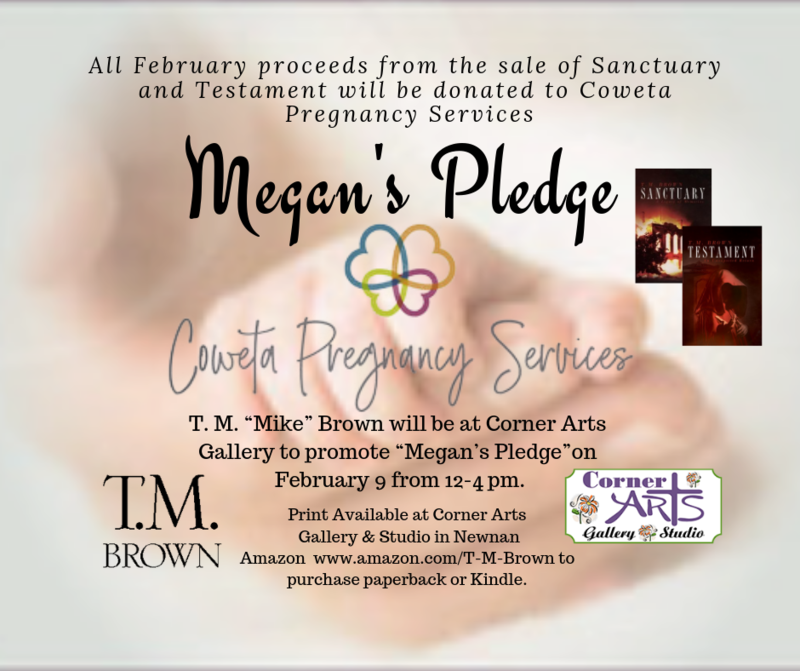 Megan comes to realize that one can compound a lousy choice with more poor decisions that hurt others, but more often than not, God exposes our secrets to begin the healing process of a broken and contrite heart. So, why do you write your stories? 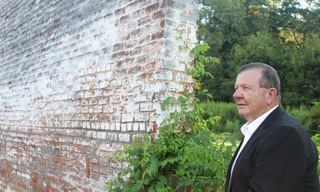 T. M. Brown is a Southern boy at heart, although he’s lived and traveled in many states far removed from his beloved boyhood roots in Georgia and Florida. He returned to North Florida several years ago while his two sons were still in school and enjoyed traveling throughout the South for business. After his youngest son went off to college, he ventured to New Orleans to complete post-graduate studies. 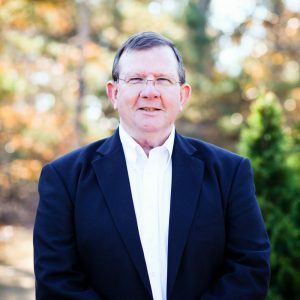 The last fifteen years, he has preached, taught and coached in Louisiana, Alabama, Georgia, and Florida until his wife and he relocated outside of Atlanta where they have since retired to write, travel, and spoil grandchildren. 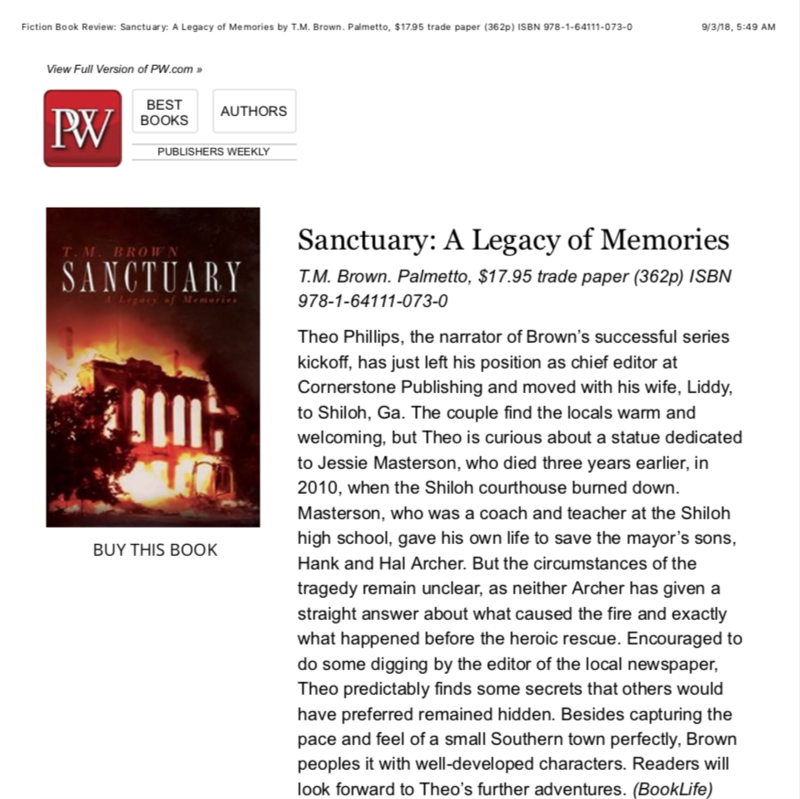 Sanctuary: A Legacy of Memories introduces newly retired publishing executive Theo Phillips and his wife Liddy to the time- lost South Georgia town of Shiloh. They leave the shadows of Atlanta and move into a quaint home of notoriety. While making new friends, they discover twenty-first-century challenges threaten the town’s laid-back lifestyle. 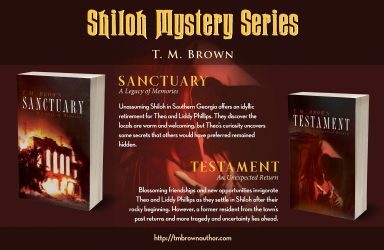 Theo’s interest in a memorial launches him into investigating tragic events that have left Shiloh unsettled. Retirement dreams face twists and turns that could unravel both them and the idyllic life they and many others look for in little old Shiloh. 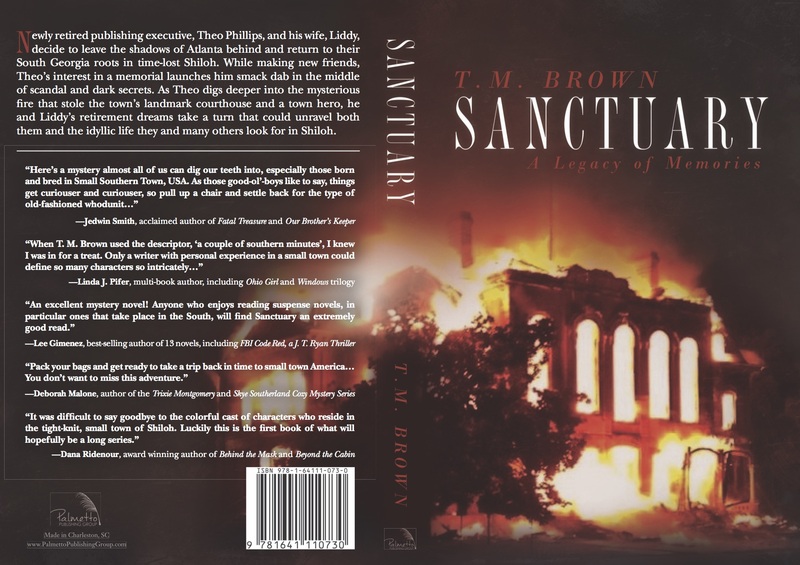 Sanctuary: A Legacy of Memories is available for purchase through local book retailers and online at Amazon, Barnes & Noble, and TMBrownAuthor.com. T. M. Brown embraces his Georgia heritage thanks to the paternal branches of his family tree. Retired since 2014 from the nine-to-five life, Brown and his wife, Connie, reside near Newnan, Georgia. When not writing or traveling, the couple enjoy sharing time with their two grown sons and their families. 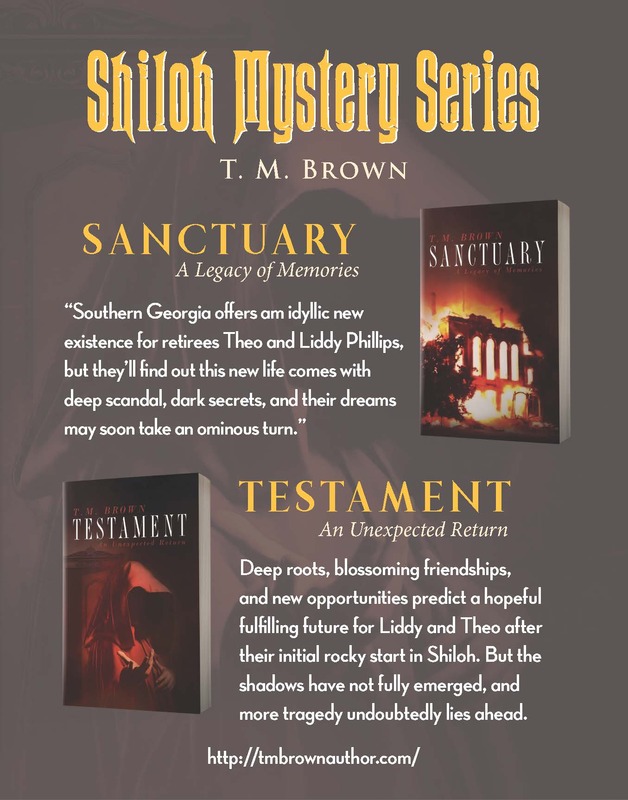 Click the image to go to BookLife page on Sanctuary, A Legacy of Memories. Click the image to find the complete review at Publisher’s Weekly. Lightning bugs or fireflies, which is correct? 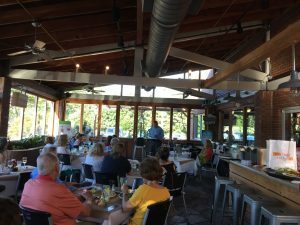 In the third upcoming installment of my inspirational Southern mystery series, little ol’ Shiloh will be hosting their annual Spring festival, but I have struggled in providing the right name for the festival. According to a linguistic study conducted at NC State (see the map below), most of Georgia as well as throughout the peanut & cotton Deep South, its a coin flip which term is most prevalent, but, as Theo argues, most of the South refer to them critters as lightning bugs. Help me to name Shiloh’s Spring Festival. 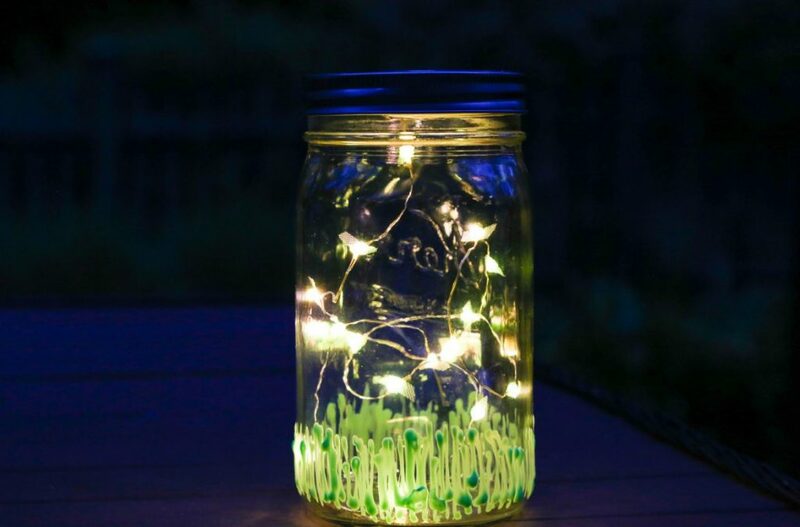 Are you a lightning bug lover or a firefly person? Green areas – predominantly firefly; Blue areas – predominantly lightning bug; Pink areas – interchangeable with names. Your feedback will help Shiloh name its Spring Festival! 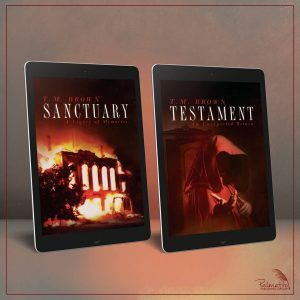 If you haven’t read either Sanctuary, A Legacy of Memories or Testament, An Unexpected Return, head over to the bookstore page and take advantage of the free shipping offer on the paperback editions. 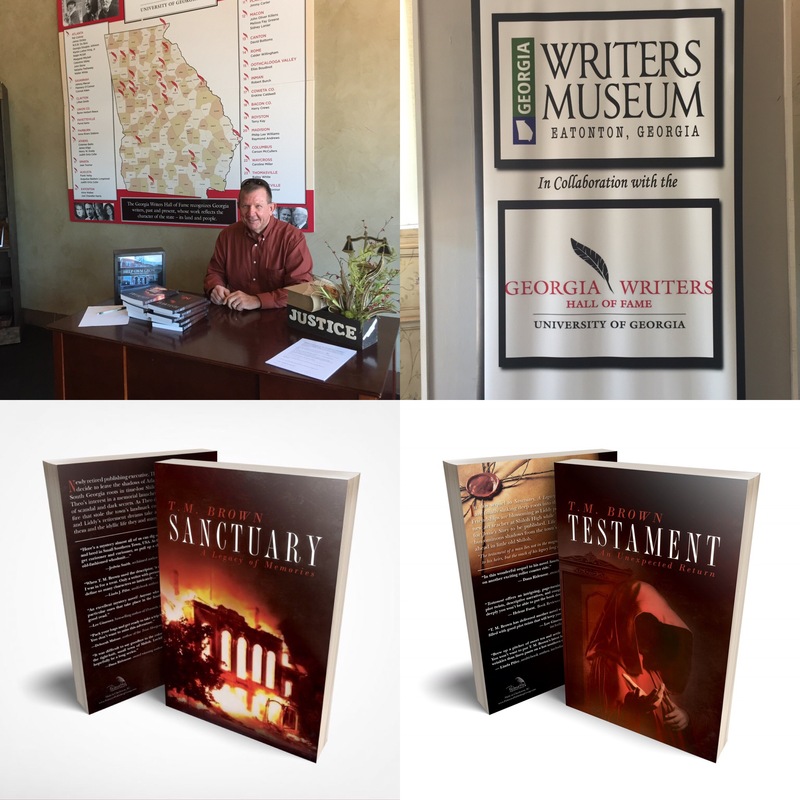 Don’t forget to support the Georgia Writer’s Museum in Eatonton, GA.
Here’s Chapter Two from Testament, An Unexpected Return that I used in the reading to the audience Sunday night. Right after a potential reader eyes your book cover, the next critical test to pique the interest of the reader is page one of the story. Does it beg the reader to read more? For this reason, I begin and end writing and editing with the first page. Like in real life, “first impressions matter” in establishing relationships. We don’t often get many second chances. Neither do our books should the first impression fail to pique a curious reader’s interest. 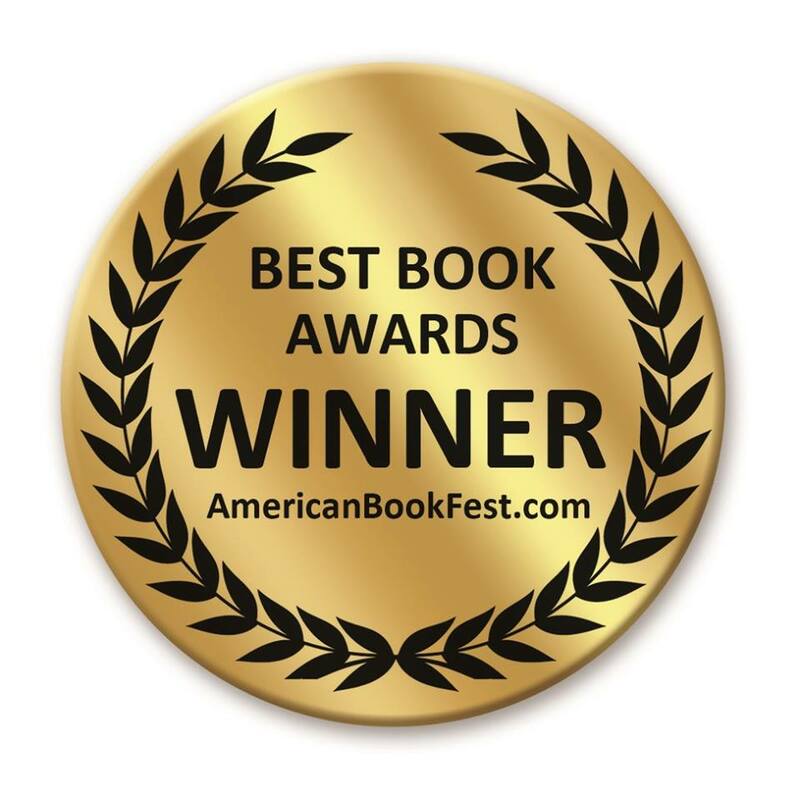 As an independent author, my books do not have the advertising and promotional blitz advantage afforded by the top publishers hawking their stable of best-selling authors. T. M. Brown does not have the name recognition of best-selling authors, such as Grisham, Patterson, Baldacci, Karon, Blackstock, etc. Like the myriad of other new books published this year, the majority lacking the deep pockets and name recognition, success boils down to passing the sensory appeal test. What is the sensory appeal test? Does the book cover stand out when on display amongst the notable NYC published best sellers, or does it shrink almost unnoticed, overshadowed by more noticeable book covers? 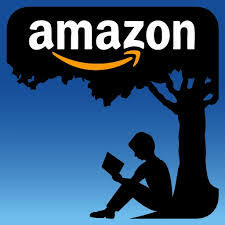 Maybe its the competitive nature within me, but I desire my books to compete among the notables, the best-sellers. I prefer my books to be on the eye level front shelves in the bookstore; not relegated to shelves set aside in the back of the store. Why is that important? Okay, T. M. Brown is not a household name in the literary world, but when my book covers are displayed beside notable names that readers seek, Sanctuary, A Legacy of Memories and Testament, An Unexpected Return are exposed to more potential readers. BUT, now the senory appeal test begins. 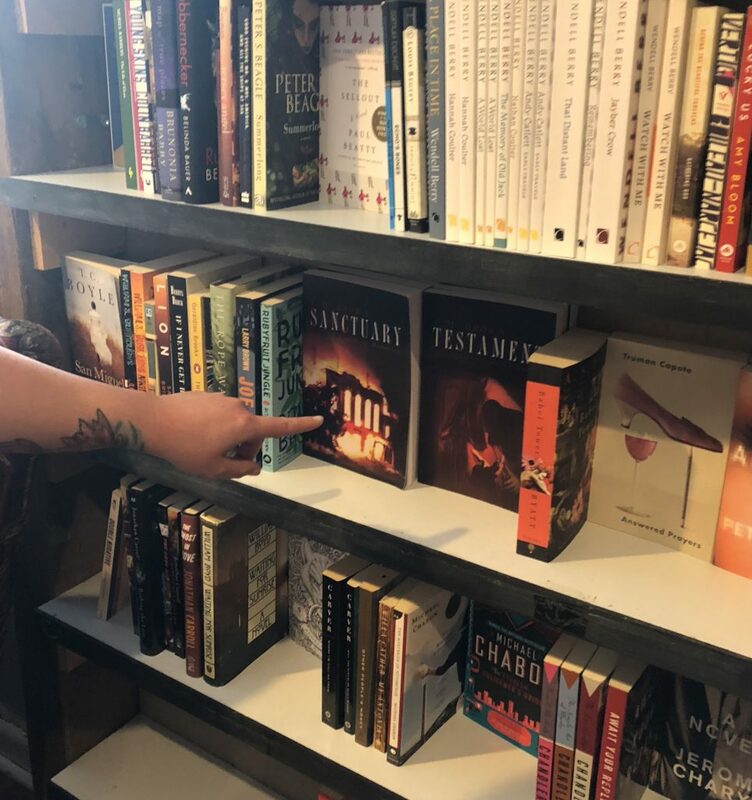 When either of my book covers catches the eye of a perusing reader and they pause to slide the book off the shelf for a closer look, the reader’s keen senses in the next few seconds decide the fate of my book. 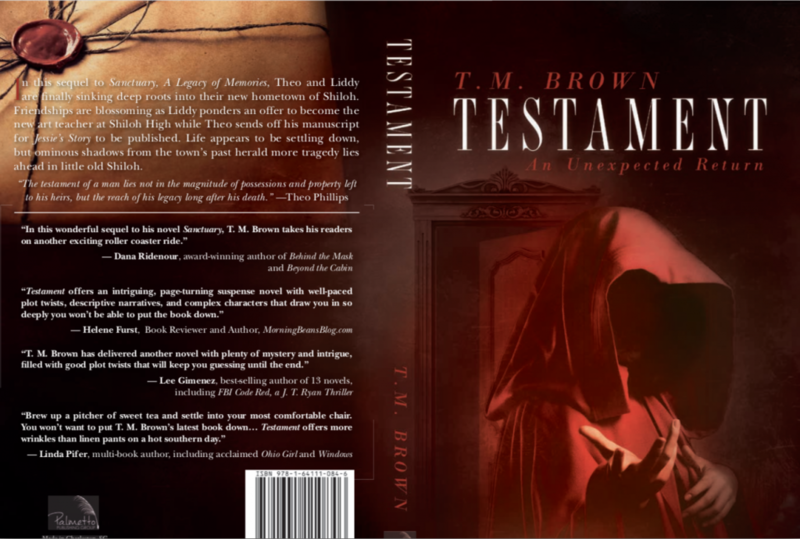 Without the notoriety of the more familiar author Dan Brown, it is the front cover which then earns an extended feel of the book. Palmetto Publishing Group utilizes heavier stock paper to print its books, and it is noticeable to the feel. The reader then flips to the back cover and peruses the carefully edited snippets about the book. If the book cover has passed the initial sensory appeal test the reader invests another critical moment and thumbs through the pages before eyeing the first page. Those first 200 or so words reign supreme over the next few seconds as the reader weighs the quality of the content of this interesting new author’s novel. Should by chance the reader flip the page or closes the book but runs their hand over the cover once again, chances are a decision is underway. In that brief moment, the weight of the first page matters. Now its your turn. What do you think? How much time do you give to selecting out a good novel to read? 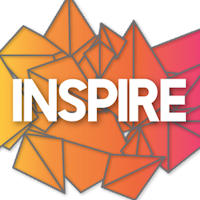 Are you narrowly focused on tried and tested bestsellers? Are you a reader who more often than not feels dissatisfied by the novels being hyped and peddled by the big New York City publishing houses. Sadly, there is more and more pressure for the assembly production of novels by the notable authors. They are easy to recognize because the author name takes up the top half of the front cover. They are promoting the author’s reputation, not the story inside. So how do my books stack up? 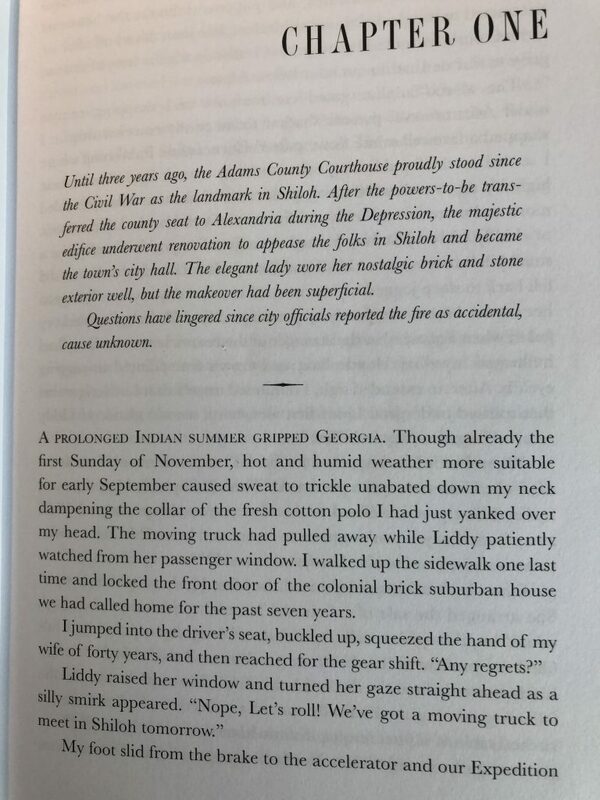 Do the first pages cause you to consider reading more? 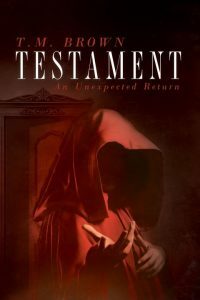 T. M. “Mike” Brown has recently released his second novel, Testament, the sequel to the award-winning, Sanctuary. Welcome, Mike. What message do you hope readers take away from this book? Life offers unexpected twists and turns, but God designed this roller coaster ride we refer to as life. At every twist and turn lies a choice to be made – some clear-cut and others not so much, but each decision usually rests between what is right and what may seem best. Whether what is right and what appears as best are compatible or in conflict, we should always trust what is right and allow God to use our circumstances for His glory, even if the choice embarks us onto an uncharted and uncertain path. It’s amazing how our faith strengthens when our future appears bleak, and shadows lurk at every turn we can see. Reflecting back, what do you see as most significant to your publication journey? Never allow your judgment to be clouded by fancy promises and lots of smiles and friendly handshakes. Do your due diligence. The publishing journey entails what appears to be unwelcome pitstops and painful advice. There are no shortcuts to success. Embrace the pitstops and opinions provided, and invest in and trust your editor. Proofread before you submit to your publisher and again after they hand you the advance reader copy of your book. Take the extra time to proof carefully. It’s kinda like inspecting your child before his or her first prom dance. How do your faith and spiritual life play into the picture and affect your storytelling? As a former preacher and teacher, my faith and spiritual walk played a sizable part in deciding my stories. 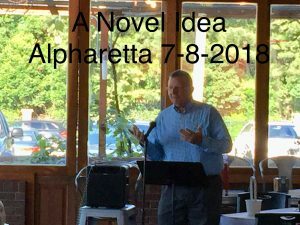 I decided to write to the broad audience and use Southern small-town life as my setting so it would naturally interject some of my faith values and spiritual dilemma decision-making without preaching a good story. Those who have a firm church foundation will get a slightly different take on my stories than a non-churched reader. I have found this to be very accurate in book club discussions by the nature of the questions and responses shared. I am a firm believer that we should eagerly cross the bridge to meet people where they are at in life without casting judgment, and hopefully bonding on familiar ground. In the end, I pray those seeking God no matter their background will hear a message that helps them in their search. On a quick note: The most memorable portions of the biblical narrative are not verbatim verses we struggle to memorize but the stories and parables we learn early in life that speak about God’s love, mercy, and forgiveness. 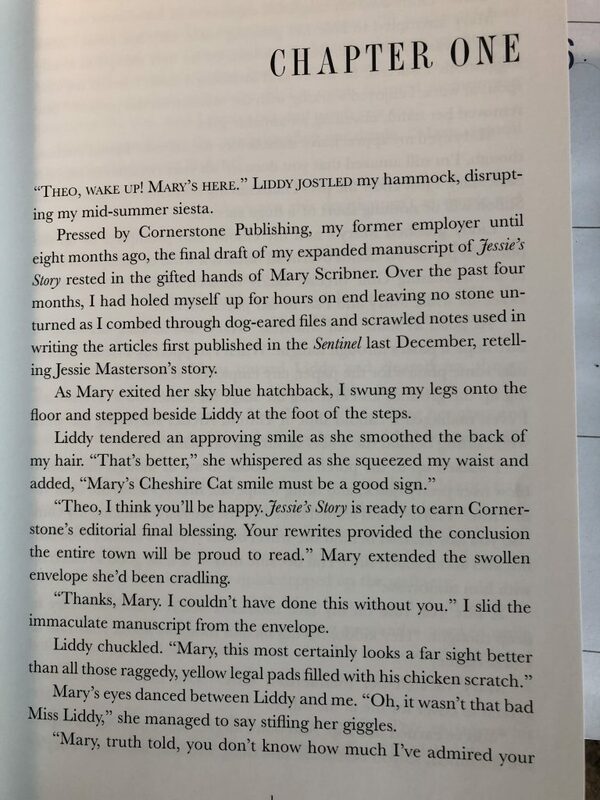 What do you consider the greatest moment of your writing/publishing career? That is a tough one. Seems something new is around every corner. The celebrity aspect makes me feel a little bit uncomfortable. However, a better answer would be the cumulative moments that have created memories of how my wife and family have been with me throughout the journey. Connie, my wife of the past 45 years, travels to every event and invests her talents to help make each event special for everyone we meet. For this reason, I believe the most significant moment of my writing/publishing lies yet around the next corner. What have you learned from writing a sequel? The sequel is always more comfortable to write than the first! 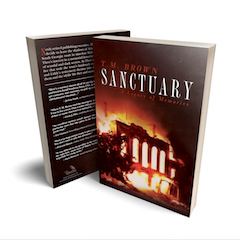 There was so much I learned writing Sanctuary. First of all, I did not have a sequel in view when writing it. It wasn’t until some of my Beta readers urged me to write a sequel and my publisher then asked if I would consider it too. Thankfully, my editor and writing coach smiled and remained on board for the year it took to complete the sequel. A far cry from the nearly 2-1/2 years for the first. What do you think makes your style of storytelling unique? I write what I know best. I love Southern time-lost towns. They offer the most intriguing settings and indeed the most entertaining character opportunities. 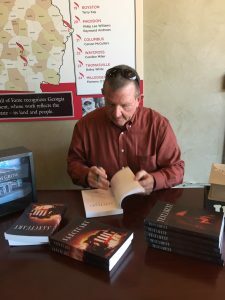 Besides my father and his parents had country roots in Georgia, and through the writing of my stories I reconnected and recognized why my father raised us as he did through my siblings and me were raised in suburban settings and far from the countryside he used to talk about. 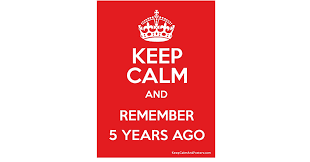 I miss my father and grandfather but found in writing my stories many long-forgotten memories, and tall-tales about our family surfaced and became a part of my stories. 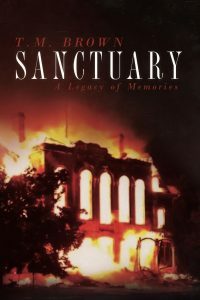 You have a significant amount of Biblical, theological, and literary history featured in the background story for Sanctuary. How did this passion for history come about? What led you to choose the genre in which you write? My grandkids will read my stories more readily than my biblical writing and sermons, or any of my expository papers about my beliefs. So, as I said above, my wife reminded me the value of stories and parables which planted the seed for what turned out to become the Shiloh mystery stories. Of course, someday I may sit down and rewrite to publish some of my biblical studies as I had planned, but for now, I’m enjoying entering lil’ ol’ Shiloh with all its colorful and quirky characters whispering in my head nearly every day. Besides, I can work through Dr. Arnie Wright, Shiloh’s Baptist preacher boy, to communicate valuable messages I’d like to share. How do you feel the setting a small town differs from a more suburban or urban setting? What do small towns offer that the suburbs might not? That’s easy. Faith, family, food, and yes, even football have a life of its own in a small southern town. Church-life is more social and connected by bonds of multi-generational families. Country cooking is the grease that spins tall-tales faster and spreads gossip further. Maybe it’s the sweet tea, peach cobbler, fried chicken, smoked ribs, grits, and handmade biscuits. Of course, cooking in the kitchen is an art, a way of life in the country that suburbanites or citified folks just don’t rightly understand. In the small-towns, life just moves at its own pace, and it’s the seasons, the sun rising and setting, and the weather that dictates what any particular day holds. In small-towns, knowing other people’s business ain’t being nosey, it’s just neighborly. As a result, there are less locked doors and more handshakes shared in small towns. Sharing time with my family, mainly my five grandkids. They’re growing up faster with each new day. 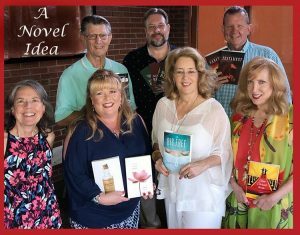 When not with the grandchildren, Connie and I enjoy our expanding author network and find opportunities to help other aspiring writers when we can. Baldacci’s, The Fix right now, but Terry Kay’s, The Kidnapping of Aaron Greene is next up. Of course, my reading takes second place to my writing so I don’t read as much as I would like. Hopefully look down from heaven and smile as my granddaughter shares the book her “Poppy” wrote with her granddaughter. She’ll laugh as she points to where she makes her cameo appearances in my stories along with her brothers and cousins, and of course, “Grammy” too. Enjoy the journey on which you are engaged. Laugh at yourself and with others. Success is a journey, not a destination, and comes sans any shortcuts. Allow God the final word on all decisions you get to make in life. Tiffany Amber Stockton has been crafting and embellishing stories since childhood, when she was accused of having an active imagination and a flair for the dramatic. Today, she has honed those skills to become an award-winning author and speaker who works in the health & wellness and personal development industries, helping others become their best from the inside out. She lives with her husband and fellow author, Stuart Vaughn Stockton, in Colorado. They have a daughter and son, and a Shiba Inu-mix named Nova. She has sold over 20 books so far, three of which have won annual reader’s choice awards. She is represented by Tamela Murray of the Steve Laube Agency. www.amberstockton.com. Go to the bookstore tab to order your copy of either or both novels. Available in Kindle or Paperback. You can also email me to discover the nearest indie bookstore to you to get your copies as well.